This contribution is focussing on challenges for policy and sector integration in Baltic Sea marine spatial planning (MSP). The study identifies concrete coordination problems, analyses why they have emerged and discusses possible remedies. The following article is based on selected aspects extracted from case studies related to the development of regional MSP approaches in Denmark, Germany, Latvia, Lithuania, Poland, and Sweden and on an additional case study dealing with the HELCOM-VASAB Working Group on MSP. How do sector and blue growth interests as well as environmental policy issues influence the MSP processes in the Baltic Sea? How is coordination between sectors organised within the different countries and across borders? What framework can be used to analyse the relation between sectoral policies and MSP processes? How can policy and sector integration be improved in MSP processes (or related processes) in the Baltic Sea Region? MSP encompasses several economic sectors as well as environmental and social issues. Increased coordination of several economic and policy areas constitute a crucial MSP governance challenge. Increased vertical coordination of administrations should lead to more consistent and legitimate decision-making, while horizontal coordination of policies on, for example blue growth or nature protection may facilitate the detection of convergence points and potential win-win opportunities. In order to improve overall administrative effectiveness and efficiency, increased coordination of different sectors has been suggested to be of substantial importance. Analyse to what extent, and how, EU Directives, strategies and other initiatives have influenced and placed boundaries on the coordination of domestic MSP policy packages. 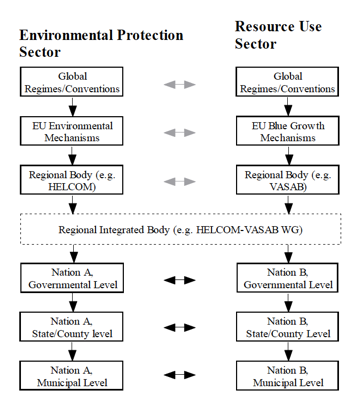 How did those EU regulations interact with regional institutions and agreements, especially in relation to the Ecoystem Based Approach (EA) and blue growth? And which types of barriers to improved policy integration can be identified. Analyse to what extent, and how, bilateral considerations, especially between neighbouring countries, have influenced regional coordination of MSP. Analyse to what extent, and how, different sectors within and between countries, have influenced regional MSP coordination? An analytical framework has been developed. Figure 1 shows a schematic portrayal of hierarchical influences from global to local levels, and potential horizontal coordination at national and sub-national levels in the Baltic Sea MSP. Grey bi-directional horizontal arrows show possible non-intentional institutional interplay between regulatory structures above the state level, whereas black bi-directional arrows represent intentional coordination at lower levels. 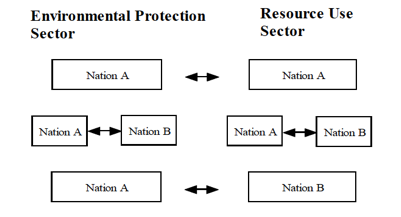 Figure 2 shows the three forms of benefit-driven coordination: Between different sectors within a single state, between the same sectors in two states and between different sectors in two states. All three forms of coordination can take place at state, county and municipal levels, as well as sometimes diagonally across levels (not shown). 1) Regional coordination without binding rules: Consensus and Institution-driven coordination in the sector-bridging and transnational HELCOM-VASAB MSP Working Group. 2) Diverging MSP policies in two neighbouring countries under the shadow of institution-driven coordination: The case of domestic MSP frameworks in Lithuania and Latvia. 3) The challenge of transnational benefit-driven coordination at national and sub-national levels between neighbouring countries with diverging domestic MSP frameworks (Sweden and Denmark). 4) Domestic sector alignment in complex settings under the pressure of institution-driven coordination: Polish fishers and the issue of (in)equality among sectors and stakeholders. 5) Cross-border MSP framework alignment in federal Germany: The role of stakeholder consultations across borders. At the regional Baltic Sea level, different logics seem to be driving MSP and Ecosystem Approach strategies. Initiatives such as the Helcom VASAB Working Group have been established to provide a forum for dialogue. Countries focus on how to elaborate domestic MSP strategies within the given institutional framework. The necessary requirement to follow international treaties and EU Directives can result in missed opportunities in terms of benefit-based transnational coordination. In this case, a primarily legalistic approach is adopted, where the focus is on what authorities have to do. Taking advantage of opportunities for benefit-based coordination is usually easier and more fruitful. The earlier it is considered in the MSP process, the better. Especially between countries with extensive prior cooperation like in the Nordic countries, it may be worthwhile to assess how this form of social capital can facilitate and stimulate benefit-based coordination. Coordination between neighbouring countries seldom unfolds spontaneously, not even between long-term friends. Despite seemingly similar interests and socioeconomic structures, neighbouring countries may not seize windows of opportunities for benefit-driven coordination. To facilitate the identification of areas that could benefit from improved coordination, strategic cross-border groups can be established. They can focus on shared mandatory components such as public consultations and on issue-areas where there are apparent benefits from coordination for both countries. To ensure effectiveness, differences between political and administrative levels in terms of competence and expertise need to be assessed. Moreover, mechanisms to bring lessons learned home to domestic administrations may need to be established. MSP is inherently political. Competing interests need to be decided upon, but where to place the balance, is a political decision. Although valuable in many ways, stakeholder participation mechanisms often become biased, favouring strong and well-organised interests. Therefore, governance in areas where some stakeholders can be presumed to be highly influential whereas others become marginalised may need to be moderated by governing structures that give weak groups a stronger voice. An important issue is here how to anchor this moderation of interests at county and local levels. Public consultations play an important role in MSP. However, they are often difficult to structure in effective, transparent and inclusive ways, especially in cross-border settings. One possibility to increase long-term institutional robustness may be to establish cross-border working groups or networks, tasked to identify strategic issue-areas where public consultations across national borders are likely to be valuable. For example, the identification of relevant stakeholders and the selection of appropriate consultation designs are likely to be facilitated by having such groups or networks in place. If possible, existing forums can preferably be adapted to this purpose. Because of the individual context of the case studies and the specific questions asked in the interviews, the transferability of the findings is quite low. However, in all MSP processes sector and policy integration plays an important role. Therefore, other studies can build upon the methodology and can find inspiration in the presented findings.